Robert Day stands by the Lockheed 10E Electra, made famous by Amelia Earhart’s attempted trip around the world. Here at Ingenium, National Volunteer Week (April 7-13) provides an opportunity to acknowledge and celebrate all of the volunteers who enhance the unique visitor experiences we provide across all three museums — the Canada Agriculture and Food Museum, the Canada Aviation and Space Museum, and the Canada Science and Technology Museum. 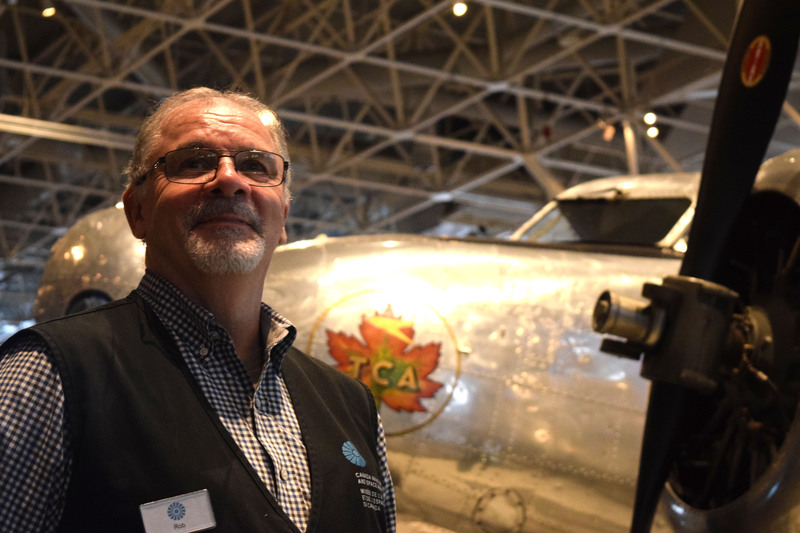 Guest writer Connor Wilkie recently sat down with some of the dedicated volunteers at the Canada Aviation and Space Museum to talk about why they dedicate their time to volunteerism. Robert Day, a former civilian pilot and a volunteer at the Canada Aviation and Space Museum, relishes the questions he gets from curious, young visitors at the museum. He recalls a recent visit from a particularly chatty little visitor. Day’s volunteer career started in 2012 when he volunteered for the NHL All-Star Game in Ottawa. Afterwards — having enjoyed the experience — Day got in touch with the museum and he has been volunteering ever since. There are some unique benefits to volunteering at a museum. One benefit that Day points out is how he is always learning from other volunteers or visitors. Dave Lowdon and Peter Krayer are both former Canadian military pilots who have an extensive background and passion in aviation. Three days a week, they can be found educating visitors about the aircrafts and adding real-world experience to the machines, having flown in similar models themselves. Lowdon enjoys volunteering at the museum because of all the unique people he gets to meet. “That's really why we both like coming here, you’re not going to meet people like this on the street,” says Lowdon. Volunteers like Lowdon, Krayer, and Day remain an integral part of the experience at the Canada Aviation and Space Museum by fusing real-world technical knowledge about the aircrafts with their unique history. The museum floor isn't the only place you can find volunteers in the Canada Aviation and Space Museum; volunteers extend out to the other surrounding buildings of the museum where overflow artifacts are stored, mainly other aircrafts and parts. But within these buildings there is a special team of volunteers working on a project over a decade in the making: The North Star project. The group involved in this project — which has been ongoing since 2003 — is restoring the last remaining North Star cargo plane. Bruce Gemmill, a retired member of the Canadian Air Force, has been volunteering on the North Star project for 13 years now. During that time, he has devoted 11,850 hours to Project North Star. “We’re going to be doing some structural repairs to the aircraft, and I might get a chance to do some work on the paint job,” says Gemmill. Although the project is definitely a marathon and not a sprint, the range of tasks these volunteers do varies from day to day. Currently, the team is working on restoring the fourth and final engine for the aircraft. Ingenium currently has 320 active volunteers across all three museums and collectively this fiscal year, all of these volunteers have contributed about 25,800 hours. Cédric St-Amour is the volunteer coordinator at Ingenium and he is in charge of managing volunteer operations across the three museums. “At the Canada Aviation and Space Museum, the volunteers tend to be experts. A lot of our volunteers have flown, built, or maintained the collection we have here on the floor — that’s pretty cool,” says St-Amour. St-Amour adds that the Canada Aviation and Space Museum currently has a core team of about 125 people volunteers. Thursday at the Canada Aviation and Space Museum is a busy day for volunteers. They start the day by enjoying coffee and refreshments in the volunteer lounge before heading out on to the museum floor. (Left to right) Dave Lowdon and Peter Krayer, two long time volunteers with the museum, pose for a picture in the storage hangar next door to the museum. Lowdon and Krayer have flown several of the aircraft models found in the hangar. The North Star is still undergoing intense restoration. Scaffolding surrounds the exterior of the aircraft, allowing volunteers to work on it safely. Michel Coté, one of the North Star volunteers, works on the interior of the aircraft. So far, the team has completely restored the cockpit of the aircraft and is working to restore the rest of the interior. 408 and 427 squadron decals. These decals can be found on many aircrafts throughout the museum’s collection, they are in reference to the different squadrons that have flown the aircraft.